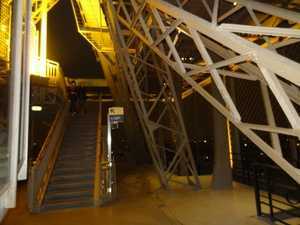 It was in 1884, at the time of the first studies of the monument that the problem of traffic on the Eiffel Tower arose. The desire of the design, Maurice Koechlin, was to have elevators, but you still had stairs, if only help. It was built with 4 staircases, one per pillar, ranging from Ground floor to 2nd floor, plus a fifth leading from the 2nd to the top. The descent, by cons, can be done by any of the 4 stairs, and it is even a recommendation to go down by another pillar than the South, it allows to see something else in the descent compared to the climb. A little higher up and up to the first floor we enter the floor, which is still 7m high, and suddenly we pop up to "free air" (if we can say) on the platform that is protected only by a small padding. These outputs-inputs are sometimes barred, they are in maintenance or they are prohibited for any reason. Do not worry, there is always one open at least, and if the descent can be done in an elevator, even if we have a ticket to climb on foot. From the first floor the staircase continues towards the second. As so far, these are flights of about ten steps in a straight line at the end of which a bearing allows to turn in the opposite direction for the next flight. The length of the bearings is always low, and it is variable depending on the height because the higher you climb, the higher the tower is vertical, so the bearings must be smaller. From there it is the height that is the most surprising. as soon as you leave the first platform the view is on Paris and its horizon, and you really have the impression of climbing to heaven in an endless staircase. When we approach the 2nd floor we have the same feeling of crushing as the first, but lower because the platform is smaller, but the arrival is very similar. 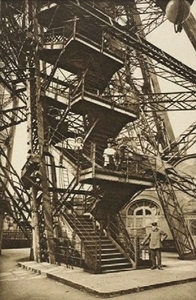 This staircase was laid at the construction of the tower in 1888 and 1889. It was spiral, the visitors were protected by a thin, relatively low railing, which gives the impression of being very fragile. The most impressive are those photos of the last century on which we see Eiffel at the top of his tower, 300m, standing nonchalantly at this tiny guardrail. He served quite a few years before being sentenced. 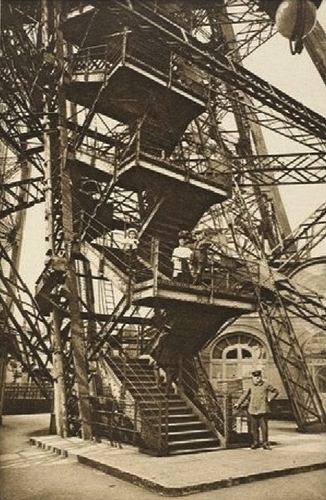 In 1983 it is dismantled and cut into 24 sections from 2 to 9 meters high, then auctioned piece by piece with the exception of 4 of them: One is on the first floor of the Tower, one went to the Musée d'Orsay, another to the Musée de La Villette, the last at the Museum of Iron History, Nancy. The sale of the other 20 pieces took place on the first floor of the Eiffel Tower on December 1, 1983. They all leave as predicted by the specialists of the subject, most in private collections, around the world. Some have been resold several times. A section of 2.70 meters was awarded in 2009 at a historical price of € 550,000, ten times its estimate, won by a private American buyer, Martin Seling. In 2003 a private Swiss collector resold his own. At a height of 3.50 meters, it consisted of 19 steps and weighed 750 kg. At the time it was estimated at 30 000 €. At the initial sale in 1983 the singer Guy Béart had bought two. He had installed them in his garden, that of his house in Garche, near Paris. Perfectly maintained, he had to pour heavy blocks of concrete to ensure their stability. He sold them on March 21, 2015 along with a series of personal items, causing the end of the presence of sections of the Eiffel Tower in a private collection installed in France. It was the last one. In the same vein on November 19, 2007, in Drouot, the SVV Ader resold section 14 for 180 000 € to a Dutch entrepreneur who uses them to symbolize the rise of his company. Where are the sections today? They are located all over the world, but circulate a lot through purchases and resales. One section is found in the Yoishii Foundation Gardens in Yamanashi, Japan, another near the Statue of Liberty in New York, while another section is in Disneyland. The city of Levallois-Perret has bought one (It is in this city that rests Gustave Eiffel). The City of Nogent-sur-Marne did the same. Most are in private collections in Canada, Switzerland, Italy and Brazil. The sculptor César, meanwhile, recovered in 1983 elements from the work of lightening the tower for his sculpture-tribute to Eiffel. This is an original foot race since it consists for the participants to go as quickly as possible from the ground to the 2nd floor of the tower. The Verticale de la Tour Eiffel is a complete climb of the world's most visited monument, the "vertical km" of the EcoTrail de Paris®. It is a race format ultra fast, timed, on the model of a time trial. It has been held every year in March since 2009, and is part of a growing global racing series, vertical racing, the first of which was the Empire State Building in New York. In 2016 the winner finished in 7min 48'77 '' for men and 9min 48'90 '' for women. 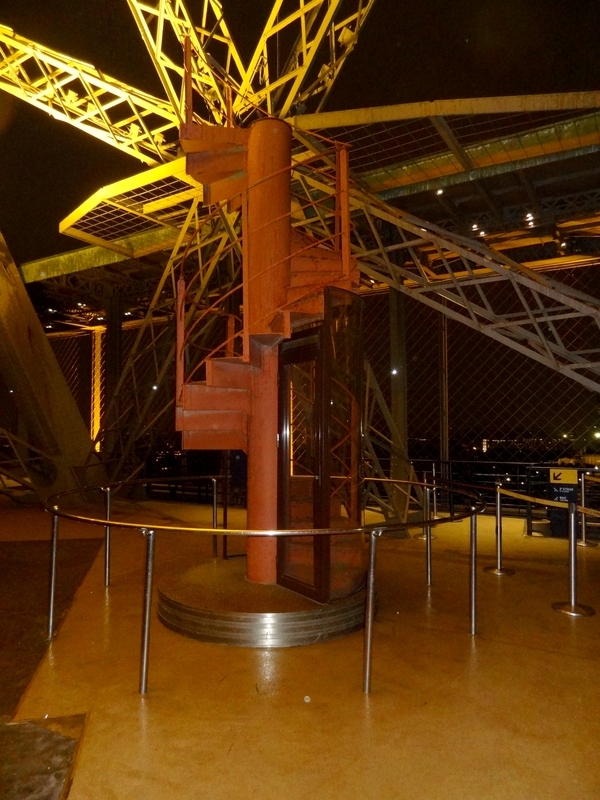 In 1900 the tower was renovated the first time, the stairs have undergone some changes, here is the explanation, given by Gustave Eiffel himself. The elevator of the South pillar is removed and in its place is installed a wide staircase used to perform descents from the first floor; the two existing staircases at the east and west piers will be assigned only to the ascent, and this service will be doubled relative to what existed in 1889. In addition, the four small spiral staircases, from the first to the second, whose use was not practical, will be replaced by a large single staircase located in the South stack in extension of the new staircase. The two staircases of the East and West pillars from the ground to the first platform were modified when they left the ground, because of the existence of the accumulators of the new elevators, which during their uphill race come to occupy the location of the old stairs. 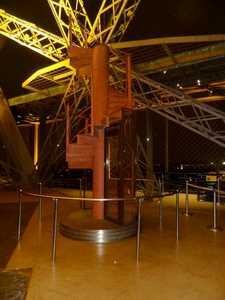 The starting flight bypasses the location of the accumulators and at a height of about 6 m joins the old staircase. This arrangement is shown for the West pillar in Figures 12 and 13 of the board XLVI. From the ground to the 1st floor there are 14 revolutions of 3,666 m of height including 24 steps, plus a starting flight on the ground, of 21 steps, and an arrival flight of 7 steps, in all 564 steps. For the part of the 1st to the 2nd floor whose width is 1.50 m and whose large flights have no bearings, the revolutions, numbering 15, also have 3,666 m of height including 24 steps of 152,7 mm; but the width of these differs according to the position of the revolution on the road. The starting flight on the 1st floor includes 14 steps and the arrival on the 2nd includes 7, which gives between 1st and 2nd 381 steps.